They might not be the two best teams in the Mountain West Conference but Air Force and UNLV certainly know how to put on a good show when they get together at the Thomas & Mack Center. 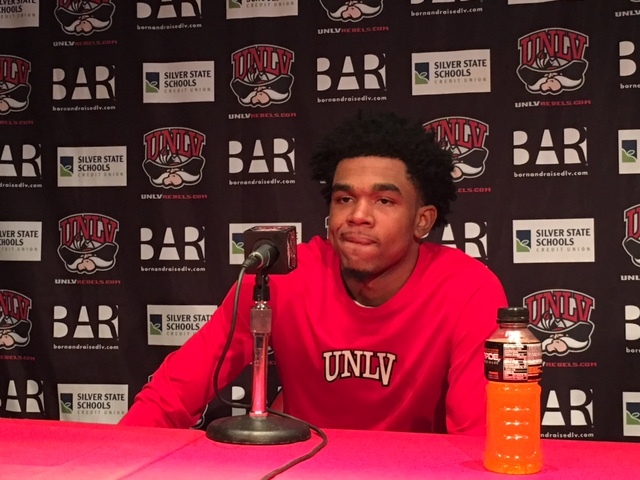 Just a little over nine months after the Runnin’ Rebels needed three overtimes to put away the Falcons, 108-102, in a wild first round game in the Mountain West Tournament, UNLV (10-10, 3-4 MW) needed two more overtimes following a game-tying, buzzer-beating 3-pointer by point guard Javon Mooring at the end of regulation to defeat Air Force, 87-85, on Saturday afternoon. Mooring finished with a career-high 30 points and connected on 7-of-14 3-pointers, including an off-balanced 30-footer from in front Gucci Row that banked in to send the contest into overtime. The Rebels appeared to have the game won after another long Mooring 3-pointer with 3.2 seconds left in overtime gave them a 70-67 lead. But Air Force guard Jacob Van answered with his own buzzer-beating 3-pointer that also banked in to force a second overtime. Mooring scored eight points in the second overtime, including a pair of free throws with 3.2 seconds to go that sealed it. Those two free throws, which gave UNLV a 87-82 lead, became even more magnified when Van hit another 3-pointer at the buzzer. WHO STOOD OUT: Although he was only 8-of-21 from the field and had five turnovers, Mooring more than made up for it with his long-distance shooting, connecting on 7-of-14 3-pointers including the clutch buzzer-beater to force overtime. He also had six assists, five rebounds and three steals. “The play wasn’t originally for me but once I got it I knew we had to get a shot. I was lucky enough for it to go off the backboard. I’ll take it anytime.” – UNLV point guard Jovan Mooring on his game-tying 3-pointer at the end of regulation. UP NEXT: The Rebels begin a two-game road trip on Wednesday night at Wyoming. The 6 p.m. contest will be streamed on UNLVRebels.com. NOTABLE: UNLV won despite shooting just 33.8 percent from the field, including a dreadful 21.9 percent (7-of-32) in the second half. … Air Force had several chances to put the game away in the regulation at the free throw line but made just 15 of 27 (55.6 percent) at the foul line. … The Falcons had a 17-0 run early in the second half, holding the Rebels without a point for six minutes and 15 seconds. … UNLV finished with 21 assists on its 26 baskets. … The game featured 10 ties and 15 lead changes. … Both teams committed 10 turnovers but the Rebels took better advantage of Air Force’s miscues, finishing with a 19-11 edge in points off turnovers. … Forward Hayden Graham led Air Force with 22 points and 10 rebounds before fouling out midway through the second overtime. … UNLV moved into a tie for seventh place with Wyoming (13-7, 3-4) in the Mountain West with the win while Air Force (9-11, 2-5) dropped into a three-way tie for last place with San Jose State and Utah State.